If you are having trouble compiling everything in your "exported" folder, then try manually activating the autocompiler. Head to "C:\Program Files (x86)\Steam\SteamApps\common\Don't Starve Mod Tools\mod_tools" and double click on the autocompiler. You probably shouldn't be deleting your old .zip files, either. I just compiled my character into DST for the first time and I didn't have to delete anything. On another note, is anyone familiar with what face-32.png is used for in the DST version of this template? 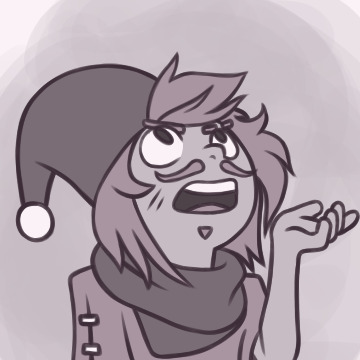 I tried all of my emotes and the yawning animation but I never saw face-32.png. Is it just me, or are Extended Sample Characters way smaller than the vanilla ones? Like, if Wilson stands next to a grass tuft, his hair will come up to the top of the grass tuft. But if you stand an Extended Sample Character next to a grass tuft, they'll be slightly shorter. In order to keep it from looking weird, I had to set the scale of my character to about 6/5. So, is there something wrong with the Sample Character? If so, is Dleowolf aware of this? "Looks like that wandering flock of penguins just set up their nest next to a murderous spider den...Poor spiders." "I've never done beekeeping before! Let's try beekeeping!" *Catches three bees* *Winter begins* "Fuuuuuuuu-"
@Corrosive Yes! Yes! Yes yes yes! That's exactly what I needed to know! 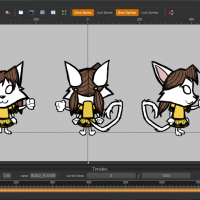 The spriter file looks a little derpy, but I can see all of the animations and the facial swaps. Thank you so much for helping me out with this! Now I'll finally be able to finish this character's art after months of work. Yeah, and it looks like Dleowolf made his character a lot more "cheery" in some of the animations (like /facepalm) so it's a good thing I found out how to view these. @Corrosive I appreciate the help, but I'm afraid this does not solve my problem. You see, in the newest version of the Extended Sample Character, there are a bunch of face files labelled face-0 through face-30. I do not know which face file matches up to which emote. Your emotes.lua lets me know what all of the commands are, but I do not know if something like face-19 is supposed to be /cry, /sad, or something else entirely. It's hard to tell because many of the faces look very similar. Yes, I've done ROM-hacking in the past so I'm aware of this method. The problem is, I cannot see any of these animations in-game. All I can see are the emote images, and I have no idea which face matches up to which emote. @Dleowolf Could you please tell us all which face file matches up to which emote command? I have worked on this character for several months and this is the final thing I need to draw before I start scripting. Does anyone know which face files match up to which emotes? I've been using this video as a reference, but Dleowolf's character barely resembles Wilson and there are a bunch of lazy edits in the face files. I can't tell what's what aside from the obvious ones like /angry and /waves. EDIT: If possible, could someone please upload a video with all of the sample character's emotes? I don't have DST so I can't do this myself. I know this would probably take a while, but I'm sure a lot of people would be able to use it! All of my character's lines are finished! All that's left is updating to the newest template and adding the new faces. Hey, Dleowolf! It's nice to see you updated the OP with a much better tutorial. The autocompiler is a piece of garbage and working through all the technicalities is a nightmare, so it's nice to see a shiny new tutorial has been put up. @HungryBerryBush I initially inserted the wings as pigtails, but they looked really odd when they were animated in-game, with the pivots in the wrong place. Currently I have them attached directly to the torso, like so: @Sabeku Ah yes, please tell me when you manage to resolve your Z-layering issue! And if you have any hunches as to how to change a character's Z-layering, go ahead and tell me. I'll use my Notepad++ wizardry to play around with the .xml files and share my findings if I manage to change anything in-game. Hello! I have a bit more of a technical question here concerning layering. I added some wings onto my character's torso, but the z-layering isn't right. On the left is how they currently look, and on the right is how I would like them to look. I've tried editing my .scml, build.xml and animation.xml, but none of the changes are being applied in-game. Hmm...If DS is supposed to take place 1920-ish, wouldn't the Flare Gun be called a Verery Gun? (Edward Wilson Very invented the gun) That, or it could be called the Flare Gun and Wilson's description would be "It can shoot off verery bright lights."